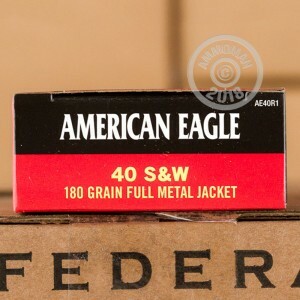 Federal's American Eagle brand is a popular choice for range and target shooting due to its low cost and solid performance, particularly in the area of cleanliness and fouling. This is an important advantage when shooting large amounts of ammo such as this 1,000 round case of .40 S&W, which comes in 20 boxes of 50 rounds apiece. Ideal for practice with a Glock 23, Springfield XD, Browning Hi Power, or Smith & Wesson M&P, these rounds use a typical 180 grain full metal jacket bullet, reloadable brass casings, and non-corrosive Boxer primers. 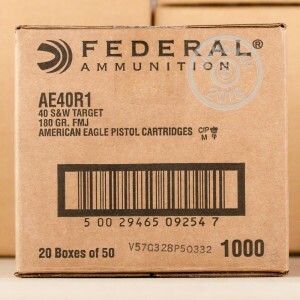 This ammo ships for free thanks to AmmoMan's policy of shipping all orders over $99 at no charge. The price you see here is the one you get, with no hidden extra charges. I shot these ammo through my HK and I loved it. No jams. Best ammo for the price. The AE40R1 is the exact same training ammo used by the PD where I volunteer. I have never witnessed a misfire on the range. Officers use G22 & G23 Gen4s. 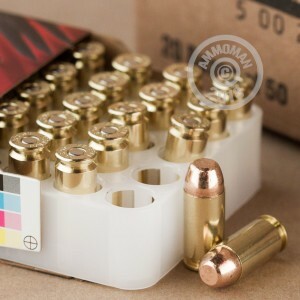 Personally, as a consumer I've always felt that AE ammo is overpriced (retail); but AmmoMan sure makes it competitive. Use in my Glock. No problems clean ammo. Great service, quick delivery. Good ammo. Glock 23/27 shoots just fine with this ammo. Will purchase again.